As an Assistant US Attorney in New York in the early 1990s, James Comey was part of the anti-mafia campaign and became well versed about how its top bosses perceived themselves, the people who worked for them and the world. As FBI chief a quarter of century later, he saw the same worldview — in newly-elected President Donald Trump. Recounting a meeting where he seemed to have angered Trump by contradicting him, Comey tells us that the encounter had left him “shaken” for he had “never seen anything like it in the Oval Office” under the previous two presidents he had served. “As I found myself thrust into the Trump orbit, I once again was having flashbacks to my earlier career as a prosecutor against the Mob. The silent circle of assent. The boss in complete control. The loyalty oaths. The us-versus-them worldview. The lying about all things, large and small, in service to some code of loyalty that put the organisation above morality and above the truth,” he writes in his autobiography. And as we go on to find out in the book, this is another aspect of the significant role that Comey would play in the 2016 US Presidential Election, apart from his decisions on “the matter” (the word is significant, as we learn) of Hillary Clinton’s email server being perceived as having damaged her campaign. These interactions with Trump, where Comey’s “loyalty” was sought in the wake of the probe into Russian support/links against his campaign team and he was even purportedly told to drop the case against a recently-resigned aide (National Security Adviser Michael Flynn), could have far-reaching consequences — for the new President. While Comey was unceremoniously fired, his claims would lead to a Special Counsel investigation that has reached uncomfortably close to Trump — Luke Harding’s “Collusion — How Russia Helped Trump Win the White House” shows how. But while around half of Comey’s book is devoted to his decisions and experiences in the Clinton and Trump episodes, it has much more than these two major issues, and is certainly not an explosive, tell-all account — he is too principled and conscientious a lawyer and public servant to reveal what is the court’s domain to the public. But it does clarify his position in the Clinton matter, where he seeks to explain what the issue was all about, and what lay behind him telling Congress in October 2016 — a few days prior to the election — that the probe was being reopened. As he reveals, the decision hinged on whether to inform Congress — which could influence the election — or conceal it — which could have been as problematic for the FBI if evidence of prosecutable criminal activity emerged later. “Put that way, the choice between a ‘really bad option’ and a ‘catastrophic option’ was not that hard a call,” he argues. 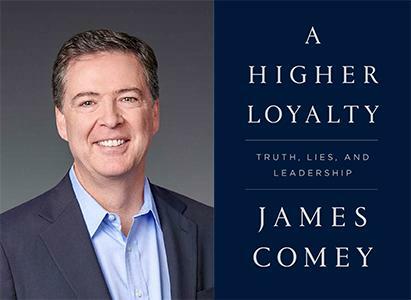 This is Comey’s memoir with the parts on Clinton and Trump the highlights, but the good lawyer he is, he builds up to them, showing why he acted the way he did by detailing his formative influences and his career. These include the childhood experience when a criminal burst into his home and threatened him and his brother, a wise boss at the department store where he worked part-time, bullies at school, and encounters with the Mafia bosses and killers as US Attorney. Then, as Deputy Attorney General in the George W. Bush Presidency, there was the “Stellar Wind” surveillance — where he had to forestall two senior administration officials trying to obtain a hospitalised Attorney General’s concurrence — and torture of terrorists and terrorist suspects by the CIA, and being appointed FBI chief by Barack Obama in 2013. While the comparison of the three Presidents — and their cabinet colleagues — is well brought out and extensive (say, their political styles to sense of humour — or lack thereof), the main point is their attitude to justice, or rather to those tasked with ensuring it. As we learn from history, and increasingly from the news, there is no doubt what the rankings will be. This, along with Comey’s observations on the ethics of leadership and the pursuit of justice free from any political considerations, is what makes this book more than a political memoir. "The US south has motels where you are likely to be greeted with 'Kem Cho'"